Sattler’s closed 36 years ago, yet we still know the address by heart. 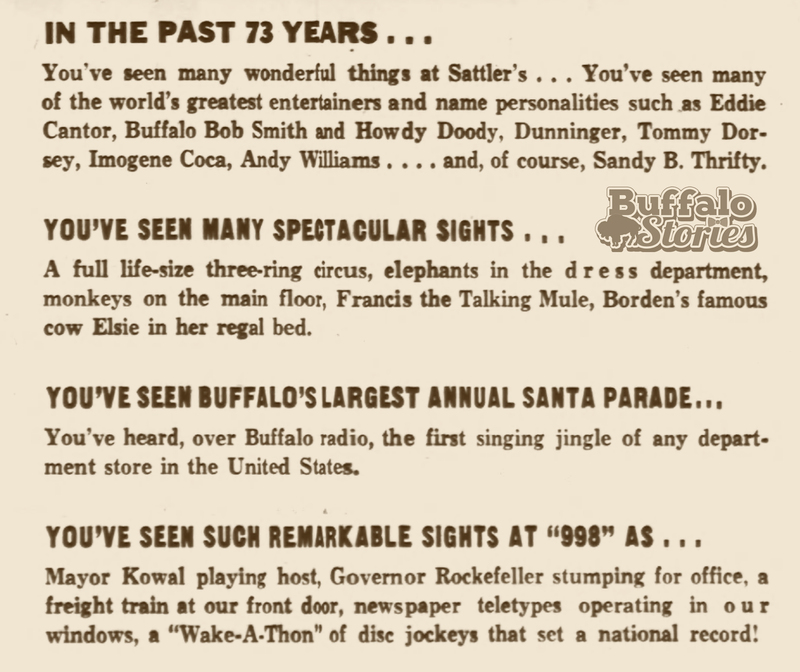 While the jingle indeed helped Buffalo remember that now iconic address, more than that, without the jingle– we might not have known Sattler’s at all. 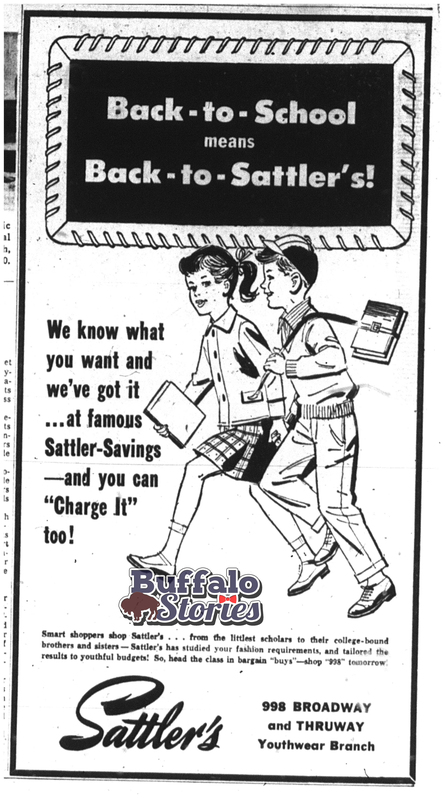 Sattler’s from a 1954 ad. Despite decades of heavy print advertising and growing from a single store front to an entire block across from the Broadway Market, Sattler’s couldn’t seem to bust through as much more than a neighborhood Broadway/Fillmore store. The radio singing commercials did something that years of print ads just could do. People from all over Buffalo, especially more elusive wealthy customers, started shopping 998, where they were buying everything from canaries to thuringer sausage to mink coats at Sattler’s. 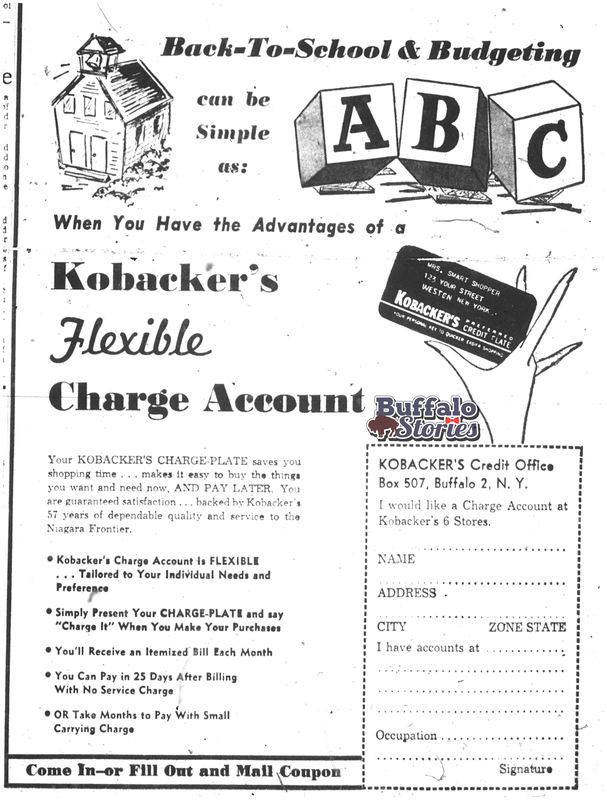 Those iconic jingles were filled Buffalo’s airwaves in 1950, playing 102 times a week on WBEN, WGR, WKBW, WEBR and WBNY. 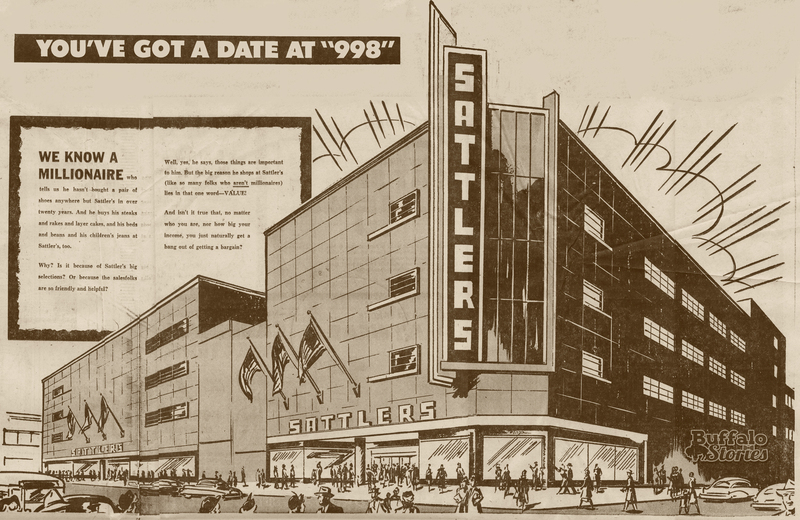 Sattler’s was at the cutting edge of over-the-top, cutting edge, marketing and self-promotion. Despite having been gone for almost 35 years, Buffalonians still have only one thought when they hear the address 998 Broadway. 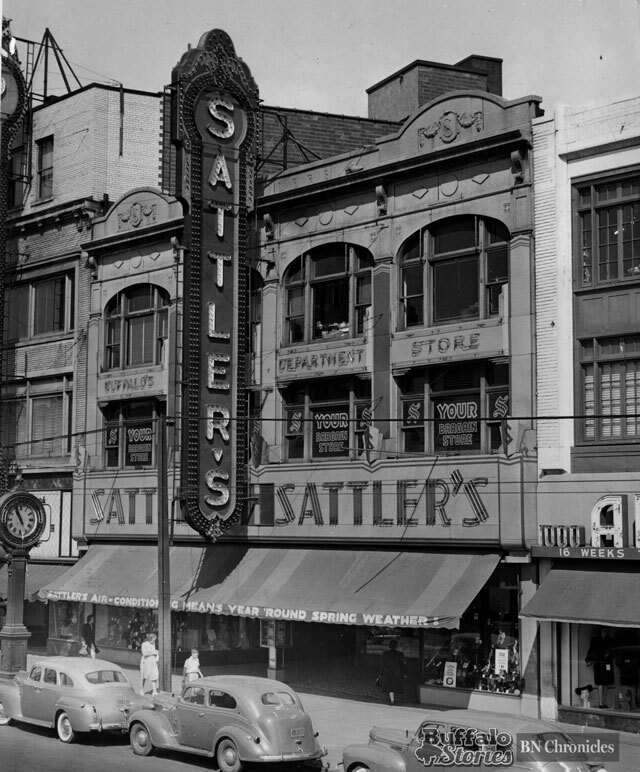 This photo of Sattler’s location at 998 Broadway was taken the day founder John G. Sattler died in 1941. 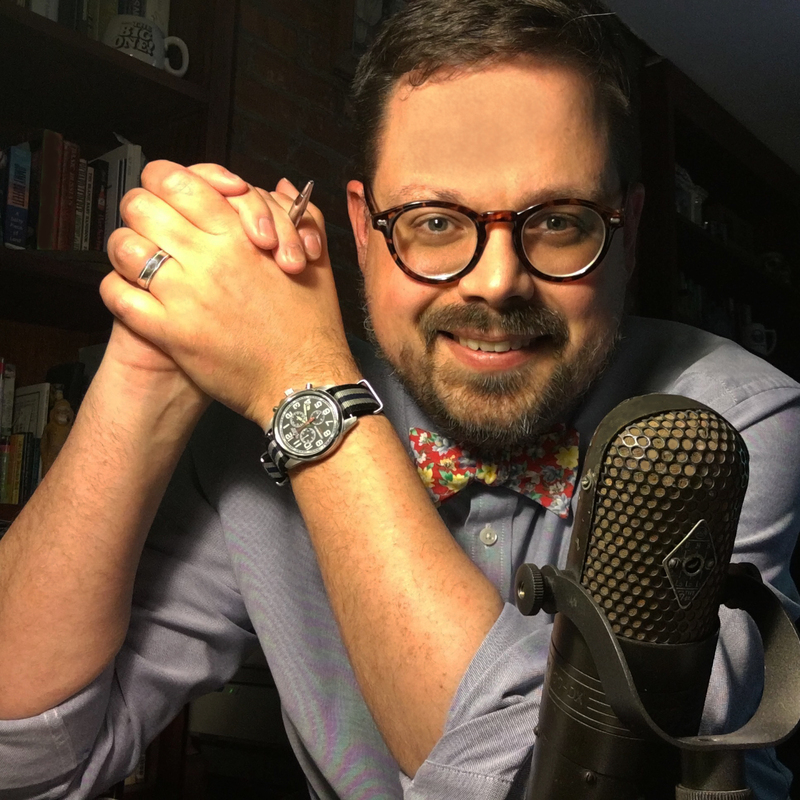 As a teenager, Sattler opened a shoe store in the living room of his mother’s home at 992 Broadway. His business would grow and add product lines, becoming a marketing juggernaut and the backbone of the Broadway-Fillmore shopping district. The store’s odd and interesting array of bargains, big events like their Christmas parade and that first-of-its-kind “Shop and Save at Sattler’s, 998 Broadway” jingle made the store a destination for people from all over Western New York. 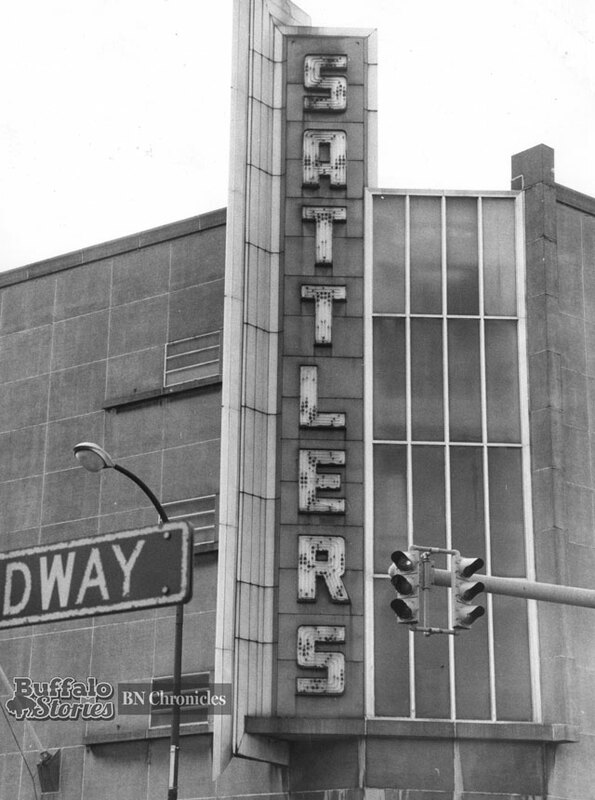 In the 1960s, Sattler’s became an anchor tenant in a handful of Western New York’s new shopping malls. 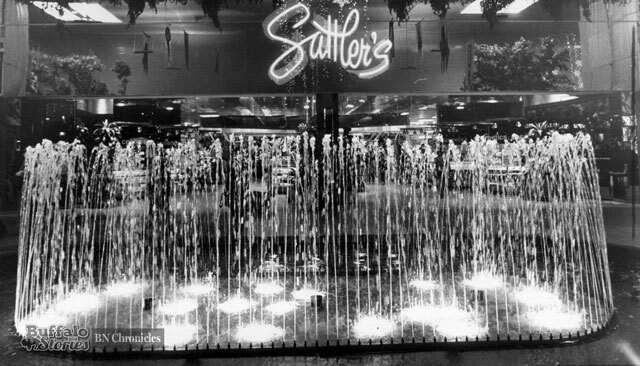 Sattler’s went out of business in 1982, but the landmark Broadway-Fillmore store was stripped of the Sattler name a year earlier. For its final 13 months, it was known as the 998 Clearance Center. It carried castaways from the Main Place, Boulevard and Seneca Mall locations. The 998 location was torn down in 1988. 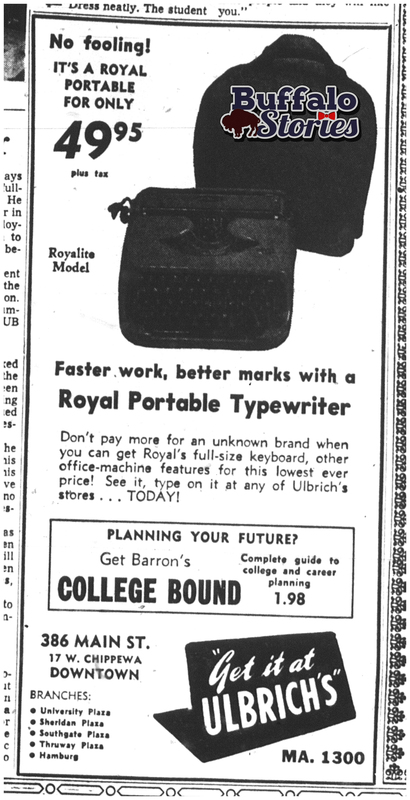 Fifty-five years ago this week– the last week of August, 1960– The News’ special back-to-school section featured articles on the latest in education inside and outside of the classroom, and, of course, plenty of back-to-school ads. 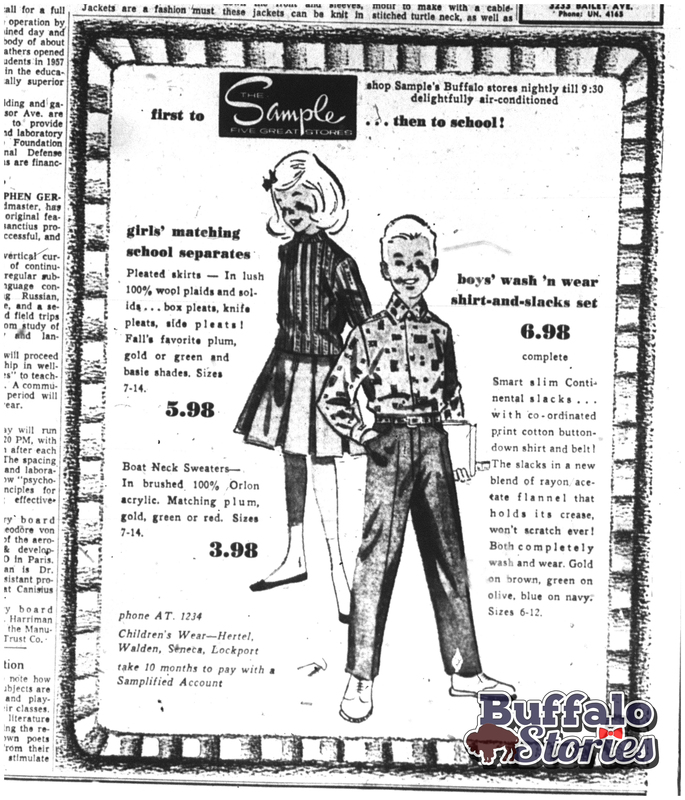 Clothes shopping was a much more gender-specific endeavor in 1960 — while many larger department stores and discount stores obviously offered accouterments for both sexes, there were also plenty of specialty shops that catered to only boys or girls. 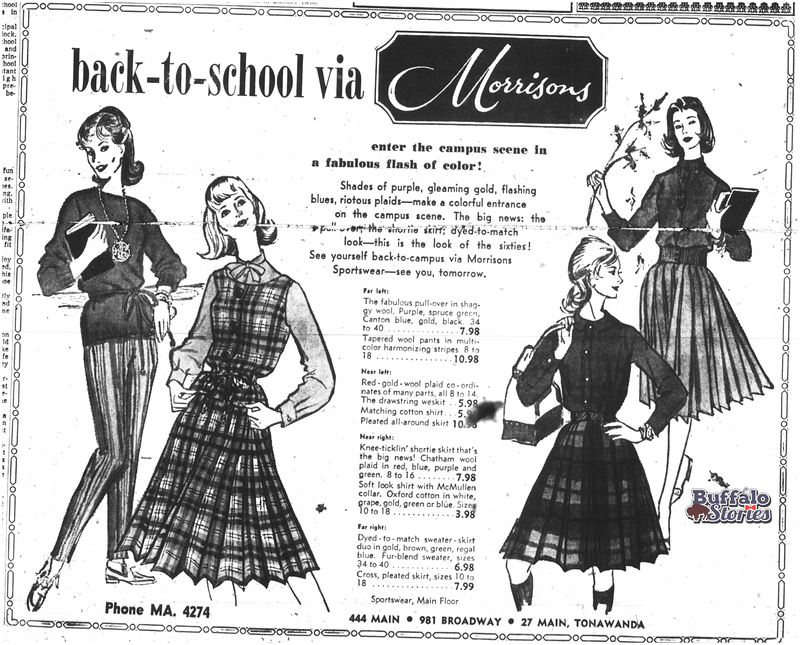 Girls were looking for dresses and skirts as they found new school clothes 55 years ago; most schools banned girls from wearing slacks. Goldin’s, Morrisons and Oppenheim Collins all catered to women and girls. 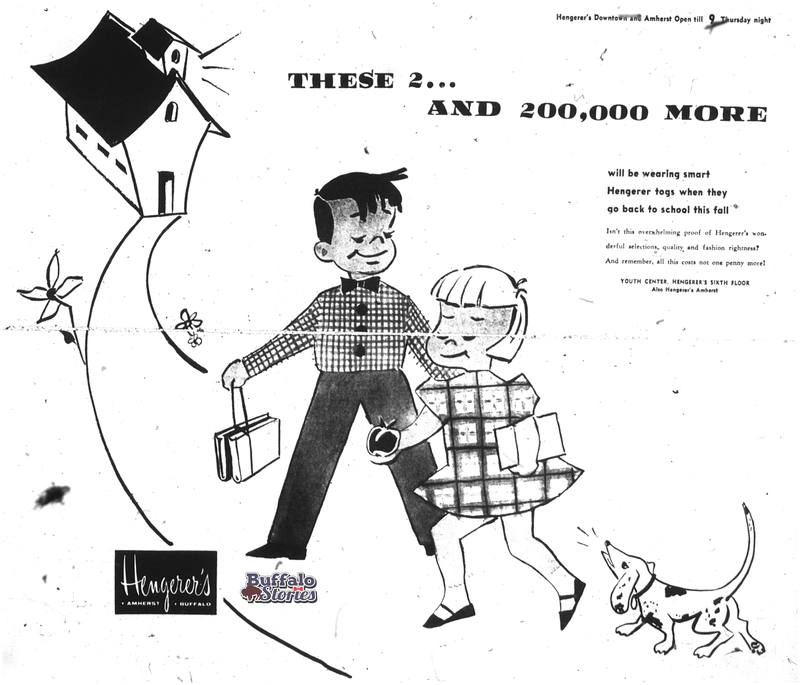 Hengerer’s, Kobacher’s, Neisner’s, Sattler’s and the Sample sold men’s and women’s fashions.